One of our favorite local organizations helping animals is Unchain Winston who we support with our time and money. Please enjoy their very first video and if you like what they’re doing, please consider a year end, tax deductible donation. Today is Small Business Saturday and the perfect day to spread the word about us and what we do. Facebook is making it harder and harder for small businesses to compete and be visible to those interested in our custom pet portraits. If you like us and enjoy the art, please like, comment and share! The more interaction we get with our fans, the more people will see us. Freddie and Joey give you a big thank you and a paws up! And please support all your local small businesses and artists. Did you know that we donate at least 10% of our gross profits annually to help animals in our community? 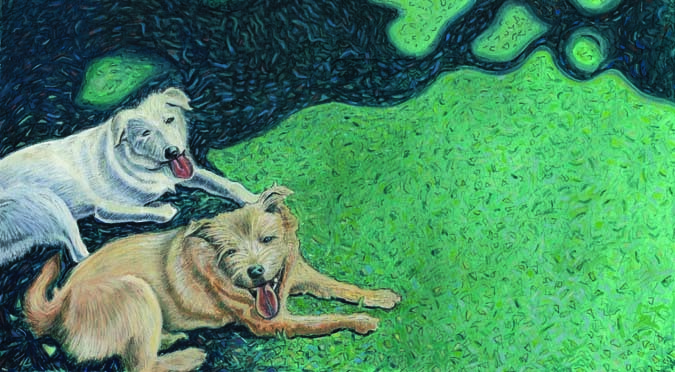 When you commission a portrait, not only are you getting the best gift ever—for yourself or a loved one, but you’re also helping animals that don’t get to live the life of those that Todd honors through art. Unchain Winston is a new organization building fences for dogs chained 24/7 in Forsyth County, NC and one that we support with our time and money. These are photos taken by one of their volunteers Sunday of their very first fence build! The first of many. Please check them out and give them a like. We’ve had a great time this week sharing the final portraits of our Spring contest winners. Both of these dogs were rescued from horrible abuse and neglect and it is very hard to see where they started but so wonderful to share in their happy endings. Unfortunately, these stories are all too common and it can be hard to see the photos and read the tales, but it is so important for us all to be aware of what is going on in all of our communities. We at Jimmydog are dedicated to fighting animal cruelty, neglect and abuse in anyway we can and awareness is the first step. Lucky’s foster mom took the time to share his whole story with us and we want to share it with you. Even though the beginning is very hard, please take the time to read it and share in his happy ending. If you see an animal suffering anywhere, please report it immediately to your local authorities. We are their voice and you can be a hero for an animal as these dedicated people were for Lucky. I’m rescue mom (Susan) and I called and said I’d take him. I sent his picture to Dr. Hedrick at Davidson Animal Hospital and asked him if he could save him for me. He texted back, be glad to help. Get him here now. Lucky weighed 21.2 pounds and should have weighed 65. He had been starved, was diseased with infections and full of parasites. I asked Barry Carter a rescuer to help me get him to DAH (we are in Charlotte). Barry stopped everything and got him there. I named him Lucky and Dr Hedrick did everything he could but the infection was all over him. He called me at 2 am and said we’ll have to give him the first heartworm treatment as the white cell count is so high this would be one way to help reduce the fever killing him. There were so many things wrong with him and yet, he always wagged his tail. He was in ICU for five almost six weeks. Right after thanksgiving Dr. H said he would live and texted me the photo from which we had the portrait made. The best text of my life! In his Thanksgiving picture, he is so thin but eating his beloved magic cornbread which Dr. H fed him to give him carbs. He was at DAH for four months, fighting all sorts of disease, and then finally I started to find him a home. I have so many rescues and I wanted him to be an only child so I reached out to another rescue group and they had one good application that I would consider. They helped me find his forever mom who brought him cornbread to meet him. The last photo is the new healthy Lucky with his new Forever mom! I am not a non profit nor a rescue group, I just knew he was mine to cover and find the entire list of people who were going to love this boy back to life. It was so worth it even though the vet bill was high, and their was so much love from so many from – Barry Carter, Animal Control and the officer, Dr. Hedrick all his staff and others. You cannot buy that. They loved him back to life. So hard to let him go, but he is living happily with his new Mom, several cats, and is allowed on all the furniture and sleeps with his mom. The first night he was up and down on the bed he wasn’t sure if he would get into trouble, but by the next morning, his mom found him sleeping with his head on her pillow. Lucky came into our lives last October, less than a year ago. Hard to believe that neighbors less than eight feet away watched him dying every day and said nothing. The silence almost killed him. Your portrait will be the cover of his ebook to tell his story. He’s just a simple dog, with a huge heart and the will to live. Happy birthday to our most special god dog George Clooney! Can’t believe that sweet boy is 9 today. 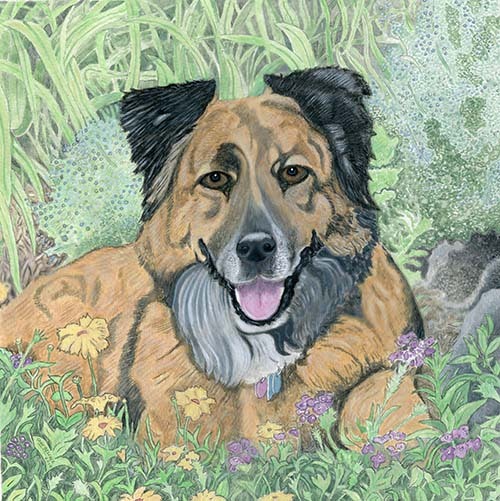 Remember Lucky the Dog? Last November, Lucky was rescued from a horrific neglect and abuse case by the most dedicated, caring group of folks. 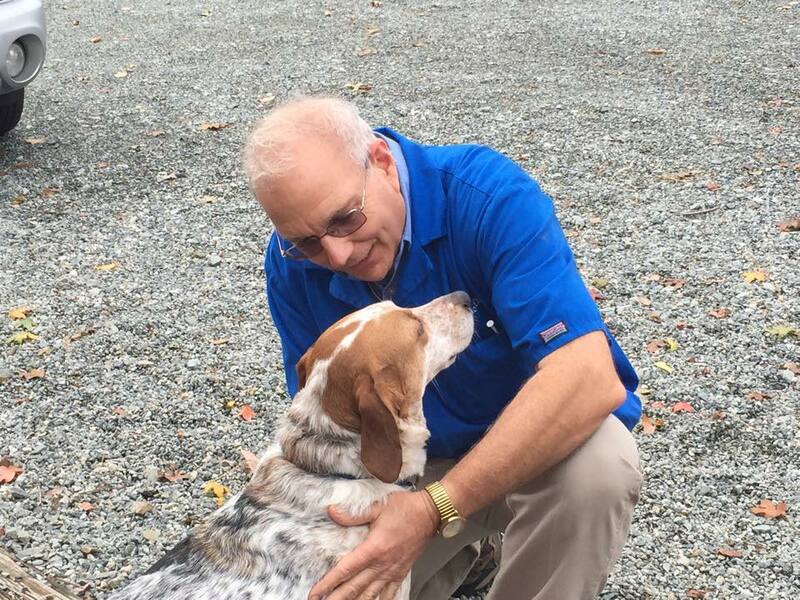 Lucky was one of the winners of our spring portrait contest and this past Saturday had a very special reunion with Dr, Hedrick at Davidson Animal Hospital and many of those special folks who all helped in his rescue. What a difference a year makes!